A Light Weight Alternative to Yesterday's Mats - The Mat King Parachute Packing Mat System is lightweight and easy and much safer to move. This feature alone can go a long way to helping reduce lawsuits and workmen's compensation claims that might result from injuries related to lifting and moving mats. The 1.25" thick Parachute Packing Mat System weighs just .35 pounds per square foot. The typical traditional alternative weighs almost three and one half times as much at 1.22 pounds per square foot. Surface: The surface of the Parachute Packing Mat System is a high quality flame retardant, self-extinguishing 24 ounce PVC sheet vinyl which is 33% heavier than the normal 18 ounce sprayed-on vinyl coating found on other mats. It has excellent cold/crack resistance, resists mildew growth, offers great color stability, has a non-slip finish, will not peel and is non-abrasive to the skin. The surface durability afforded by the Parachute Packing Mat System can save thousands of dollars or reconditioning costs incurred every 5-10 years with other mats. It is gouge resistant under normal parachute Packing use. Its tear resistance is extremely high, averaging 50-60 psi. By comparison, the finest and toughest quality products in the luggage industry average 20-30 psi. The bond between foam and surface involves no glue, which is an unsatisfactory method of bonding. Rather, a proprietary manufacturing process which liquefies the foam and the vinyl allowing them to cool together and form one permanent unit with a virtually indestructible bond and a top surface that is smooth and taut. Two people can easily and safely transport, set-up and take down each of the seven 100 pound mat sections in a 42' x 42' x 1-1/4" Parachute Packing Mat, which weighs only 700 pounds complete, by themselves. A traditional heavy mat system weighs 2,200 pounds and presents far more chances for problems and needs many more people to manipulate it. Construction: Parachute Packing Mat System features Trocellen closed cell foam well known for its resiliency and cushioning properties as its substrate. Where other mat foams break down after 70,000 impacts, the Trocellen foam breaks down after 210,000 impacts. Thus, Trocellen foam offers far longer safety longevity. Trocellen foam is dimensionally stable which means it will not shrink after it leaves the factory and will, therefore, fit tight with no gaps for 20 - 30 years. Another advantage of Trocellen closed cell foam is its resistance to water and moisture. Where traditional mats tend to soak up water from the ground and from the air which dries out the foam causing it to harden and fail, the Parachute Packing Mat System will not dry out and last that much longer. 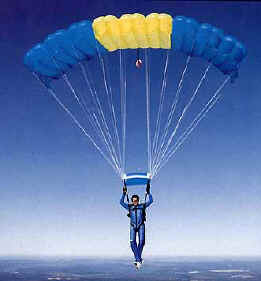 Logos: Organizational (Military Units and Clubs) insignias and logos can be painted on your parachute mat. Send a letterhead illustrating your emblem and our very talented artist will reproduce it for you. Painting requires only a few days for thorough drying. No curing time is required at our factory or in your facility. Color Choices: Standard color is Royal Blue. Custom colors (Red, Navy Blue, Gold, Forest Green, Grey, Purple, Maroon, Orange and Black) are available upon request. Paint colors are available in the colors of your choice, allowing you to duplicate your organizational colors. Colors are matched as closely as possible. Storage: Storage of the Parachute Packing Mat System is made simple since the rolls are so light weight they are easily supported against a wall by a bracket & strap system installed every six feet of mat length. When not in use, the belts simply hang down the wall providing no interference whatsoever with other activities. Prices are for budget. Please call for custom quote. Prices include Shipping & Handling (Continental US). NY, CT, NJ Sales Tax will be added. How to Order - Please provide width and length of area(s) ro be covered. Indicate background color preference(s) and camera ready art in PDF, JPG or AI format and description of where the "art" is to be located on the mat layout(s). Also, include contact name, company name, contact phone, Fax and e-mail address, and destination city, state and Zip Code for the shipping part of the quotation. Thank you.